This recipe is EASY. You should try it, if you have not. It is different from Tau Yu Bak (Stewed Pork in dark soya sauce) in taste but can be similar to Stewed Duck in Dark Soya Sauce save for some difference in spices used. I used to cook this dish quite often during my university days in England and my British housemates loved it when eaten with steaming hot rice! If you make an extra effort and fry the rice ala Egg Fried Rice, you will have a truly satisfying meal. The beancurd is a complimentary item which I add to the dish. You can also add hard boiled eggs (shell removed, of course) into the dish during the simmering stage. Once sugar fully caramelised, add chicken legs and let it “sear” for 1 minute on each side. Add water to cover the chicken by 1 to 2 cm. Add the rest of the ingredients and seasoning. Once water begins to boil, reduce to medium low heat, cover lid and let it simmer for 30 minutes to an hour. To serve, separate gravy from the rest of the ingredients. 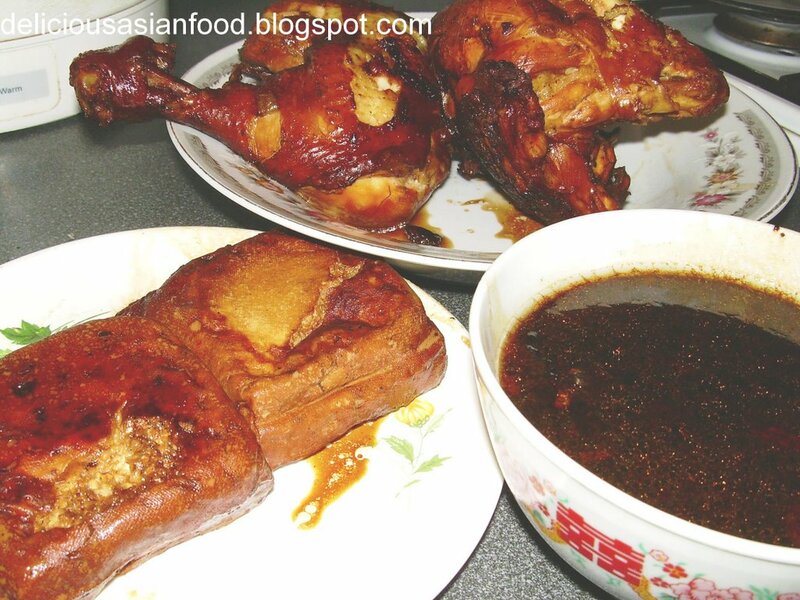 Chop the chicken to desired size, cut beancurd into quarters and half the eggs. Hey there, thanks for the recipe. Just what I’ve been wanting to make for dinner today. I was given this recipe some time back by a friend. She used soy sauce and I tried with that. Disaster. Too salty. No amount of sugar could save that. Anyway, I haven’t got any peppercorn. What can I replace that with? Chewbies : Hmm…peppercorn is essential for this dish. I suppose the next best ingredient would be white pepper powder though I must say it does not taste as good using that.